Yesterday, I was walking through the store when I stumbled across a well-known brand name at a discount store. 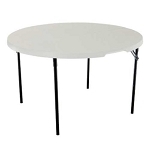 As I looked at the product, a folding table, I immediately recognized the design as being very familiar. The product was a 5 and 6-foot fold-in-half table. The product label was not what I expected because I knew the design was definitely from Lifetime Products, but this label showed a completely different brand entirely. Sure enough, upon closer investigation I found the Lifetime logo imprinted on the table. How could this be? The table was clearly of inferior quality of any Lifetime table I had ever dealt with - the table top was thinner, the leg frame was smaller, and the product was truly weaker in every regard. I unfolded the table and set it up in the aisle for further investigation. Everything seemed to be right in the design, just a poor quality. Just because you see the Lifetime logo on the table, does not necessarily mean that you are getting the quality of table Competitive Edge Products sells. Frequently, when compromising on quality - as in the case of these low-end folding tables I saw at the store - you weaken the table top and frame. This weakening means a lower weight capacity and a shorter life of use. Call or email us if you have any questions.